The Bluesolar DUO PWM is a 3-speed charge controller that can charge two battery packs. The controller is equipped with a Solar connection and two battery outputs. The range uses "Pulse Width Modulation" (PWM) pulse voltage control together with a multi-step load control algorithm. This results in a higher charge and improves the performance of the battery. The filtered PWM power control system utilizes highly efficient and reliable MOSFET power transistors. The fully automatic temperature compensation of the charging voltage is made to improve the charge control and battery performance. The battery temperature sensor, which is optional, is developed for long-term reliability. Charge two separate batteries. For example, a starter battery and a service battery of a boat or mobile home. Programmable charging current ratio (standard configuration: equal current for both batteries). Load voltage settings for three types of battery. Internal temperature sensor and optional remote temperature sensor. Protection against reverse polarity connection of solar panels and / or battery. Display of the state of charge of the battery by led on three levels. Three stages of battery charging (bulk, absorption, float). Disconnection of the output at reduced voltage load. Battery overload protection by shutting off the solar module when the battery is full. 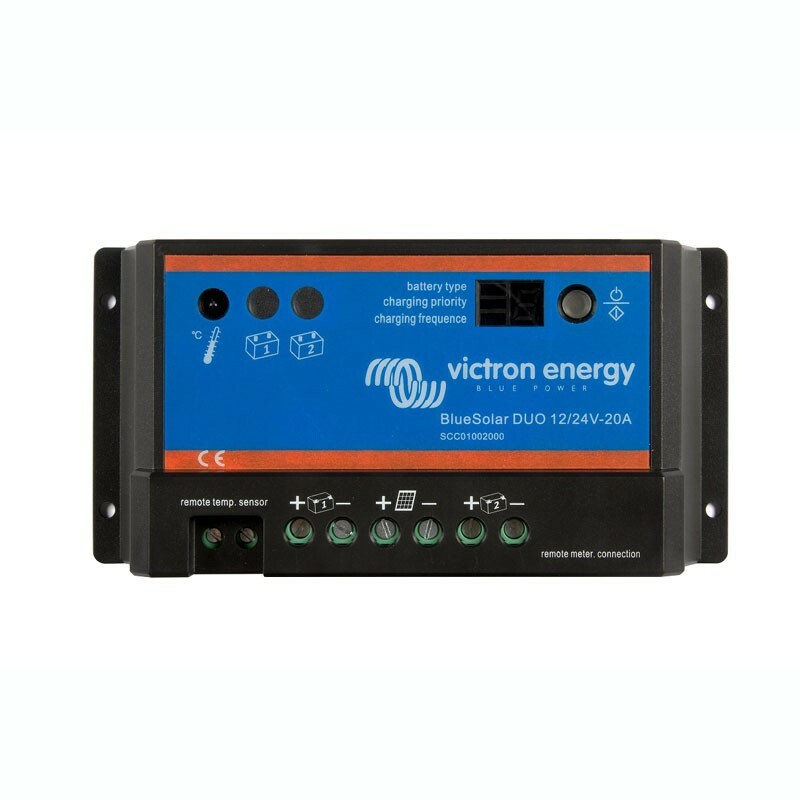 Has a 12V accessory output to connect your consumers directly (max intensity 20A). This output has a protection against the deep discharge of the battery, as soon as it reaches 10.5V, the consumers are extinguished automatically.